It was the exhibition title Drugs that had caught my attention. I’d just started my annual three-month abstention from booze, so altered states, or lack of them, were on my mind. Drugs is the fourth in a series of themed shows by Artists Anonymous, a five-strong collective formed in Nuremberg. The show is to be held in their gallery in a slightly seedy backstreet in Bethnal Green notorious for dealers — of art, that is. The previous exhibitions have been called War, Hunger and Overpopulation and Pollution. Looking at images from those shows, I thought they could all justifiably be brought in under the Drugs banner. The busy layered paintings, a mishmash of pattern and photorealism in every colour under the sun, look like computer-age psychedelia. I felt that if I stared at them for long enough, a satisfying image would come out of them, like one of those magic-eye paintings. NI_MPU('middle');I talked to two of their less anonymous members, Ed and Maya. They said that they were all “clean addicts”. Ed gave me a long, rambling explanation of the content and process of the paintings. He used the phrase “without being too philosophical” twice. He explained in a waterfall of words how as a team they built models and then dressed up and staged scenarios, which they photographed then painted in negative, then took a photo of the painting with a pinhole camera and displayed a photographic negative next to the painting. If Ed were a drug he would be speed. His nervous energy, combined with the frenetic Technicolor of the paintings, left my head reeling. The quote stuck with me because that had been exactly my experience. Having dropped a tab, I had enjoyed watching garishly coloured landscapes writhe in time with the music from my Walkman. I screamed with laughter at a friend’s perceptive observations, which turned out to be them saying nothing more than “wow, look at that”. I also became so paranoid that I was sure a four-year-old child in a restaurant was mocking me for being a druggy by miming smoking a joint. For days after a trip the wallpaper undulated if I stared at it too long. After ten or so very memorable hallucinogenic episodes, hilarious and terrifying in equal measure, the novelty wore off. All drugs have a character, and sustained long-term use of them can cause the user to absorb it into their personality, where it can reside long after the chemical effects of the drug have worn off. In my youth I spent time around people who took a lot of drugs; thankfully I had too little money or too much sense to keep up with them. Some of them died, some just became terminally boring. I still occasionally sense the masks of overindulgence clinging to people’s faces: the conniving weasel of the junkie, the brash overconfidence of the cokehead or the droopy-eyed snicker of the long-term dope smoker. What most frightened me about taking LSD were the possible side-effects of the drug on my imagination. Acid hallucinations with their seemingly significant connections, wild colours and paranoia can be particularly corrosive to the artistic imagination. I worried that the drug would affect my judgment. I feared that I was starting to confuse experiences drilled into my consciousness through drug-dilated pupils with images and ideas that were genuinely fascinating and beautiful. I found myself entering what I called my Bilbo Baggins period. I feared I would end up making heavy-metal album cover art or go all New Age and vaguely spiritual. Many artists when quizzed about their habit will trot out a rationalisation for why they need their fix. “Oh, I can’t go on stage sober”, or “I needed a cigarette to help me think”. Artistic folk can become attached to the crutch of a drug because they think it is part of what makes them creative. Studies in the Sixties and Seventies by the cross-cultural theorists Jean Houston and Robert Masters found that psychedelic drugs were indeed disinhibiters and helped artists to say and do things that they were repressing in some way. They may also increase fluency and our capacity for lateral thinking. The downside is that any drug also brings with the high its own brand of cliché and chaos. Drugs lend an aesthetic that may dominate the work of an artist working under their influence. The conspiracy-theorist rants and convoluted Gothic imaginings of the druggy artist may seem terribly powerful to citizens of Planet Bong but to sober viewers they can seem just, well, druggy. The second room of the Artists Anonymous show was painted black and featured a painting with a working electric guitar rammed into it giving off feedback through an amp. It reminded me of a bedroom I slept in when I was 15. It had belonged to my father’s stepson, who grew pot on the railway embankment. The walls were covered in silver foil and carpet and dotted with Hendrix posters and wig heads stuck with peacock feathers. This writer comes across as a right snob. It's obvious he doesn't like drug-themed art, hurrah for him, but he's making some sweeping generalisations based on nothing but his own bad experiences and dislike for drugs and drug users. Many an artist will say they have come up with ideas while under the influence of various substances. Fact is, this works for some people. Just because this guy doesn't receive his inspiration that way doesn't mean no-one can across the board. Something that is very apparent in the 'art world' is how boring and pretentious so may self-proclaimed 'art critics' are! The article is interesting, but nothing more than that. Any opinion is subjective and down to personal taste. SWIS thinks that psychedelics can be inspirational when it comes to art (and indeed other walks of life.....SWIS recalls a time in a former life where he had stuggled all week with a software problem; after a night on the psychedelic and no sleep he arrived in work the following morning and had the problem sorted in 30 minutes). However, they will not produce talent where there is none. SWIS finds that once the psychedelic road has been travelled, there is a tendency to see it's influence in all manner of places (art, adverts, etc) where perhaps there is none. The "Wow, that guy must have been on something to come up with that" syndrome. Perhaps that is just SWIS. Testament to how far psychedelic counterculture has travelled. Many forms of art feature subtleties that have filtered down into ordinary culture and turn up although the creator may never have used psychedelic hallucinogens. Same way the term "munchies", which is directly linked to marijuana use, is now a broadly used term in modern culture for being hungry. Or "trippy"/"tripping". How many kids use the word "trippy" for something bright and colourful and how many pop/rap artists use the word "tripping" for someone acting generally unorthodoxly. To my knowledge, Jerry Garcia never used heroin although he did use morphine. Still though, I wouldn't regard him as a junkie, a smackhead or a "stupid hippie" as you so bluntly put it. The man may have died due to complications involving morphine use but he was old enough and always had breathing problems in his sleep anyway apparently. It's not like his substance use was directly abusive to others either. I'm frankly surprised that any member of this forum would make such an ignorant comment. He was far from stupid too. People don't accidentally become one of the most beloved and revered guitarist/singers of an entire generation you know. What's to suggest Garcia's opiate use had anything to do with LSD and its novelty wearing off? LSD can be used just as destructively as morphine. It depends on the person and the situation. No drug use is really destructive IMO as long as it only effects one person. People should have the right to live however they please, it's their life and not someone else's anyway. What's this about the hippie generation giving drug use a bad name? It gave drug use a great name for millions of liberal thinkers. Any bad name associated with the hippie generation is a product of the subsequent undermining of it in the generations following. It's not entirely possible to spread the word of responsible drug use through mainstream culture because it's a third rail issue - you touch it, you're in trouble, especially in the case of politicians and career people. That's why counterculture exists and it should be praised by drug users because it's the only culture they can be fully accepted in. You can't be a part of mainstream culture if you're legally excluded from it. Simple as. "Dali does not use drugs. Dali IS drugs!" - Salvador Dali, when asked if he used drugs to get inspiration for his strange, surreal paintings. and @natureboy ,, im not gonna say anything about garcia again because its obviously sensitive sure everyone has the right to do what they want couldnt agree more .I do think counterculture has indd a value ,, but i dont expect so much from it on a bigger scale . do you want your grandchildren still wondering why they cant light up a joint but can drink themselve silly ? Hallucinogens such as LSD, peyote, MDMA, DMT, psilocybin, morning glory seeds, and many others are thought to be mind-expanding drugs able to increase one’s creativity. Psychedelic, mind-altering drugs have been used for thousands of years and have left their mark in almost every population around the globe (Devereux, 1997). Yet, each culture and each era have viewed and used hallucinogens in very diverse ways. One common link between the various cultures is that each has conveyed its psychedelic experience through art: drawings, paintings, dress, mass media, films and the like. This phenomenon has led some to believe that there is a connection between the use of hallucinogens and creativity (Baggott, 1997). 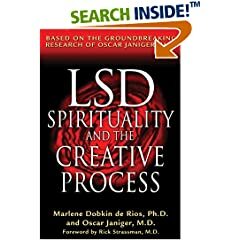 Since the late 1950s, when psychedelics became more potent and more easily available, many studies and interviews focused on the influence of hallucinogen on the creative process. Most interest was placed on understanding how the mind works under the influence of hallucinogens. Is it possible for these altered states to modify cognition so that a higher level of creativity is reached? In effect, can psychedelic agents enhance mental performance in the sense of making it more operationally effective (Harman and Fadiman, 1970)? During the early 1960s, Harman et al. led "drug sessions" where twenty-seven professionals were invited to receive doses of a psychedelic substance followed by workshops requiring creative-thought problem solving. These researches wanted to observe whether hallucinogenic experiences could improve cognition or cause a long-term personality change. Perhaps heightened creativity and better self-actualization would follow and increase the productivity of the subjects. The results showed that the subjects could describe several types of enhanced functioning during the problem solving session that are related to the effects of hallucinogens. They reported a feeling of low inhibition and anxiety. "There was no fear, no worry, no sense of reputation…," "…a lowered sense of personal danger…," and "…the normal blocks in the way of progress seemed absent…" (1970). There was also the capacity to restructure a problem in a larger context. "I could handle two or three different ideas at the same time and keep track of each" (1970). "Looking at the same problem with psychedelic materials, I was able to consider it in a much more basic way, because I could form and keep in mind a much broader picture" (1970). An enhanced fluency was also reported as they noted, "I began to work feverishly, to keep up with the flow of ideas," "…my senses could not keep up with my images," and "I was very impressed with the ease with which ideas appeared…it was the pure fun of doing, inventing, creating, and playing" (1970). The influence of psychedelic substances heightened their capacity for visual imagery and fantasy. The subjects were able to "move imaginary parts in relation to each other" enabling "fantasies to trigger ideas" in order to find solutions to their problems (1970). An increase in concentration was reported to help the subjects "shut out virtually all distracting influences" (1970). Without the psychedelic substance, one man said, "It would have taken a great deal of effort and racking of the brains to arrive at what seemed to come more easily during the session" (1970). A heightened connection with objects and external processes enabled the professionals to become more aware of the problem itself without concentrating on the self that was trying to find the solution. Further, there was a strong sense of empathy with other people; it was as if they were thinking the same thoughts or came to the same conclusions. The subconscious became more accessible as most of the subjects reported. "I was in my early teens and wandering through the gardens where I actually grew up. I felt all my emotions in relation to my surroundings" (1970). The hallucinogenic experience made it possible to associate very different ideas. One engineer was able to solve his problem when he thought of the word ‘alternate’, which led him to a logical conclusion to his problem. Most impressive was the increased motivation to solve the problems at hand. There was "tremendous desire to obtain an elegant solution" (1970). "In what seemed ten minutes, I had completed the problem, having what I considered and still consider a classic solution" (1970). All of these enhancements allowed the visualization and completion of each problem as summed up by one of the subjects, "I had great visual/mental perceptibility; I could imagine what was wanted, needed, or not possible with no effort" (1970). Some subjects even noticed long-term changes in their performance levels several months later, suggesting psychedelic experiences could be used to upgrade the progress of effective professionals. The researches believe a psychedelic experience may give a person the self-actualization to uncover his or her full creativity that could enhance special abilities. The studies of Harman et al. focused on the effects of hallucinogens on regular subjects. But what about its effects on markedly creative artists? In 1964, Frank Baron Ph.D. surveyed 91 major artists, including many highly praised and awarded artists, who were reported as having had at least one psychedelic experience (Baron, 1965). The most used hallucinogens were LSD, DMT, peyote, mescaline, morning glory seeds, and psilocybin. A remarkable 81% said they were psychedelic artists, that their work shows effects of psychedelic experiences, usually but not necessarily chemically induced at the time. Influence may have occurred during, after, or just from a reminder. 70% expressed that the experience affected the content of their work, 54% said it increased their technique for use of color, and 52% reported that they gained greater depth in art from their first experience. The psychedelic experience was a life-changing peak. Many reported the "inner life having been opened up" to a self-realization. The illogical, irrational and non-linear merged so that the "psychedelic experience emphasizes the unity of things, the infinite dance" (1965). Kripper (1972) reported that the main effect artists feel is that boundaries are melted, the unconscious block to the inner self is struck down allowing free flowing ideas. A panel of art critics agreed that this may be true and even noted that some paintings under psychedelic influence had greater aesthetic value than the artists’ prior work. The use of color was more vivid and lines were much bolder. Yet, it was also said that the technical ability of the artist was slightly impaired. Some artists even admit that what they had created under the influence of hallucinogens was not as good (1972). Many artists feel that hallucinogens spark a higher level of appreciation for art, beauty, richness of imagery, or of pleasurable sensory experiences rather than increase skill. Art is the release of what was experienced in the psychedelic experience. Several artists judged their LSD productions to be more interesting, reaching a superior mode of expression where they put together new meaning for an emerging world. Experiments carried out in 1994 by Strassman conclude with the same findings (Allen, 1994). Subjects begin as grounded artists until the hallucinogen takes him or her to a kind of hyperspace where anything is possible. This is illustrated in the changing images seen in artists’ work after a psychedelic experience. Are hallucinogens able to cause a blossoming of creativity? Most researchers say this is not the case. Artists are not formed from their chemical experience; they must provide intelligence, feeling, talent and imagination (Masters and Houston, 1968). Extraordinary experiences are what give artists their inspiration, the spark that ignites what is in the mind. That experience could be extensive traveling, religious exploration, or conversing with enlightened people; the hallucinogenic experience is just another visionary experience. Just as traveling opens a person up to new cultural ideas, hallucinogens get him or her in touch with the idea that we are only aware of such a small piece of reality (Doblin et al., 1999). Even when drugs are not involved, the creative process itself requires an altered state of awareness in order to access the contents of the mind. Hallucinogens such as LSD have been reported as only being effective in the creative process when a question or problem is at hand. Hallucinogens cannot give birth to creativity, it can only inspire creativity that is already present in a person. The finding that 90% of a group of artists were intuitive and also that a greater percentage were introverted supports the idea that creativity is a part of the personality and not the drug (Barron, 1965). Artists have special characteristics and qualities apart from those of the general population. Some of the main conclusions from the work with artists as well as with the regular subjects lead to similar realizations. One idea is that hallucinogens help to acknowledge that we do not function at our full cognitive capacity. The mind is a plethora of knowledge and memories that are usually censored by the conscience but can be unblocked by the mind-expanding qualities of hallucinogenic drugs. Hallucinogens allow different perspectives to be seen and realizations to be made. Further study relying more on palcebo results may lead to better, conclusive results. Masters and Houston (1968) describe the three levels of the hallucinogenic experience as sensory, recollective, and integral. In the sensory level, vision, touch, and hearing become distorted with most of the distortion coming in the vision. Cross-sensing or synesthesia occurs allowing colors to be heard and sounds to be tasted. Siegal and West (1975) continue on this theme reporting that hallucinations can take the form of people. Emerging ideas may project a hallucination on an external object. Self-analysis can follow in the recollective-analytic-symbolic level. This is the psychological level where the consciousness is expanded to higher realizations. The stored information in the brain becomes the stimulus for hallucinations. What is normal may become extraordinary under the influence of hallucinogens. Simple situations may take on a symbolic, historical, religious, or mysterious nature. Life reaches cosmic level, a unity that has no end. Siegal and West (1975) expand on this idea saying that there is an intensification of internal input, the inner self takes on outer qualities. More images are seen than can be processed. Unexpected and unplanned emerging ideas catch the person off guard. The integral level is the level of self-transformation that is only reached by a few. It is said this is the level when the body feels as if it loses its boundaries, becoming one with the mystical union of the world. Because each person is a product of their own culture and own individual experiences, there are myriad forms hallucinations could take. Each person calls upon his or her own subconscious memories when the censor is let down. Yet, there is evidence that hallucinogenic substances exert their effects in very similar ways (Siegal and West, 1975). Hallucinogens can effect the dopamine and serotonin systems in the brain, causing an overall excitation, perhaps setting off the locus coeruleus (Pletscher and Ladewig, 1994). They can also act as a sympathomimetic or by acetylcholine mechanisms. Siegal and West also report evidence that suggests hallucinogens such as LSD shift action potentials toward the right hemisphere of the brain, the visiospatial center. Surprisingly those with brain damage to the left hemisphere, the verbal-mathematical areas, are reported to be very talented in producing beautiful, creative art. Children under ten years of age lose some creativity as they increase their verbal and math skills, shifting from the right hemisphere to the left. This may support the idea that hallucinogens do not make creativity but just unlock it by shifting concentration to the right hemisphere. Some people such as artists, may just use their right hemisphere more than the left. There have also been studies focusing on how visual hallucinations and warped perceptions are formed (Siegal and West, 1975). Hallucinogens may act directly on the eye by raising the intraocular pressure and causing distinct patterns to be seen. These patterns can be easily seen by pressing firmly on closed eyelids. Hallucinogens may also mimic the effects of light on the retina causing abnormal reactions to and interpretations of vision by the brain. Light or pressure falling on the compact, regularly arranged rod and con cells of the retina may produce visual mosaic-like, honeycomb-like, or lattice-like patterns. Movement in blood vessels may cause fireballs, crystals and kaleidoscope visions. These perceptions are said to be entopic because they are formed within the eye. More electrical stimulus of the visual cortex cells of the brain could also accounted for visual hallucinations. The direct electrical stimulus of a man’s visual cortex during open-brain surgery caused him to see moving and non-moving lights, geometric shapes and stars (Siegal and West, 1975). An actual scale of images called form constants has been laid out by Kluever according to the reports of the images seen by users of hallucinogenic substances and according to recorded visions in art forms (Siegal and West, 1975). One group of images that are usually always reported include the lattice, fretwork, filigree, honeycomb, or chessboard images. The second group consists of cobwebs and swirls, and the third of tunnels, funnels, cones and never-ending spirals. Figures become patterns and take on the appearance of particle energy. Patterns of light are also considered part of the form constants. Surprisingly many of these images can be seen in a great deal of artwork cross-culturally. As for Grayson Perry, it's his opinion although I think he is very closed-minded. Some artist's are naturally creative, as if they've already indulged psychedelics. I would deem these individuals as being naturally high - and natually: more creative. Drugs do not increase skill or talent, however. Unless you believe creativity is a skill. I do think counterculture has indd a value ,, but i dont expect so much from it on a bigger scale . do you want your grandchildren still wondering why they cant light up a joint but can drink themselve silly ? "Reefer madness" existed long before the LSD-fuelled counterculture emerged. Just remember that. Here's Aldous Huxley on the subject of whether and how LSD influences creativity. Huxley: Yes, I think there is. While one is under the drug one has penetrating insights into the people around one, and also into one's own life. Many people get tremendous recalls of buried material. A process which may take six years of psychoanalysis happens in an hour -- and considerably cheaper! And the experience can be very liberating and widening in other ways. It shows that the world one habitually lives in is merely a creation of this conventional, closely conditioned being which one is, and that there are quite other kinds of worlds outside. It's a very salutary thing to realize that the rather dull universe in which most of us spend most of our time is not the only universe there is. I think it's healthy that people should have this experience. Swim is a painting student, and a drug enthusiast, and thinks about this often. Its different for everyone. He would say a large percentage of his fellow students are drug users to some degree or another. Amphetamines are quite popular due to the nature of the work and the speed at which one must perform. While not a fan of stimulants at all, swim has indeed made some great creative leaps under the influence of amphetamine. To a certain degree he agrees with the reporter in that when one makes art while influenced by any drug, the drug's traits will appear to some degree in the art work. For swim, understanding drugs is part of understanding art, understanding the state of consciousness which may have influenced a painting or other piece of art work is essential to understanding the work itself. Pollock was an alcoholic, Warhol and many fellow pop artists used speed. Quite a huge number of famous artists have been drawn to amphetamines, check out Atilla Lukacs. Van gogh perportedly drank absinthe and certainly had some severe mental disturbances. Kandinski was a self-proclaimed synestheet, but as there was no medical evidence of this, many believe his synesthesia was infact influenced by psychedelic experiences. All this is only touching on the visual arts as well, its not difficult to assert that many artists have been inspired by writers and musicians and cultural movements deeply connected to psychotropics. While Dali is quite famous for the "I _AM_ the drug" qoute, his experimentation with altered states brought on by combinations of extreme fasting and environmental influences is well documented, it may not have been meant in the way it is frequently interpreted. Many of his famous works were painted during or immediately after sessions in which he would lock himself in an extremely hot attic and refuse food water and sleep for days. The examples are fairly endless swim only touched on artists well known to those who haven't participated in some form of art education, the entire canonized visual arts scene has practically been built around psychoactive influences. The reason an exhibition titled "Drugs" isn't enjoyable has nothing to do with how drugs affect art, its likely simply the result of the lack of creativity of an artist who couldn't think of anything better. Saying that drugs don't work in art is just idiotic and ignorant. For him to assert that art created on drugs just seems "druggy" to a sober viewer is just plain stupid, Andy Warhol alone and his primarily middle class average american audience dispells this notion. Certainly very little of this primarily sober and prohibitionist-brain-washed demographic seemed to mind living vicariously through his work and experiences. I kinda picture one of the useful reasons for taking something such as LSD is what you bring back from the experience. As you don't black out, the thoughts and interesting oddities, the tasting and seeing color, the visualization of music, etc... all have powerful abilities to bring new concepts to the artist. Yeah, the only problem with Dali is that when he said 'I am the psychedelic, take me! ', he neglected to mention that he regularly ate hash, which rather suggests that he wasn't in fact the pyschedelic at all! So, great and all as the quotes are, it would have been more accurate if Dali had just said "Yes".